Post subject: OLD SCHOOL THRASH SPEED BLACK CD FOR FREE! The last CD of KARBONIZED TRAITOR is now available for free on NIHILISTIC Distro! Old school thrash/ speed with black influences, from France. Last edited by gabalgabow on Sat Mar 23, 2019 11:22 am, edited 1 time in total. New CDs and tapes for sale. DEMONIC RAGE (Chile) Omen of doom CD. 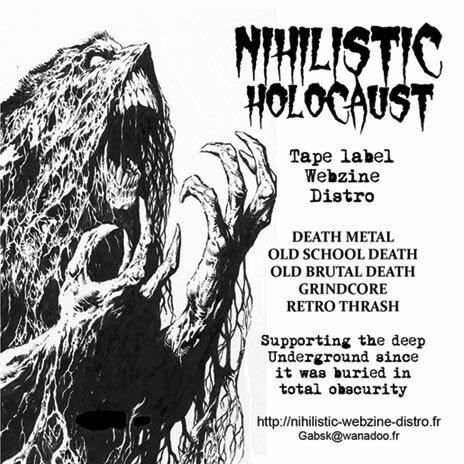 Old school death/ Obscure death (Contains demos and Eps). MASS BURIAL (Spa) Of carrion and pestilence CD. Old styled death. SADISTIC (Chile) Diabolical ascending Demo tape. Old styled death.